^ Karakorum was founded in 1220 and served as capital from 1235 to 1260. ^ Following the death of Möngke Khan in 1259, no one city served as capital. Khanbaliq (Dadu), modern-day Beijing, was the Yuan capital between 1271 and 1368. ^ Including coins such as dirhams and paper currencies based on silver (sukhe) or silk, or the later small amounts of Chinese coins and paper Chao currency of the Yuan dynasty. The Mongol Empire (Mongolian: Mongolyn Ezent Güren listen (help·info); Mongolian Cyrillic: Монголын эзэнт гүрэн; Mongolian pronunciation: [mɔŋɡ(ɔ)ɮˈiːŋ ɛt͡sˈɛnt ˈɡurəŋ]; also Орда, 'the Horde' in Russian chronicles) existed during the 13th and 14th centuries and was the largest contiguous land empire in history. Originating from Mongolia, the Mongol Empire eventually stretched from Eastern Europe and parts of Central Europe to the Sea of Japan, extending northwards into Siberia, eastwards and southwards into the Indian subcontinent, Indochina and the Iranian Plateau; and westwards as far as the Levant and the Carpathian Mountains. The area around Mongolia, Manchuria, and parts of North China had been controlled by the Liao dynasty since the 10th century. In 1125, the Jin dynasty founded by the Jurchens overthrew the Liao dynasty and attempted to gain control over former Liao territory in Mongolia. In the 1130s the Jin dynasty rulers, known as the Golden Kings, successfully resisted the Khamag Mongol confederation, ruled at the time by Khabul Khan, great-grandfather of Genghis Khan. Known during his childhood as Temujin, Genghis Khan was a son of a Mongol chieftain. As a young man he rose very rapidly by working with Toghrul Khan of the Kerait. The most powerful Mongol leader at the time was Kurtait; he was given the Chinese title "Wang", which means King. Temujin went to war with Wang Khan. After Temujin defeated Wang Khan he gave himself the name Genghis Khan. He then enlarged his Mongol state under himself and his kin. The term Mongol came to be used to refer to all Mongolic speaking tribes under the control of Genghis Khan. His most powerful allies were his father's friend, Khereid chieftain Wang Khan Toghoril, and Temujin's childhood anda (blood brother) Jamukha of the Jadran clan. With their help, Temujin defeated the Merkit tribe, rescued his wife Börte, and went on to defeat the Naimans and the Tatars. Genghis Khan ascended the throne in the Yeke Quriltay region in the Onan river, from the Jami' al-tawarikh. Among all the [subject] alien peoples only the Hui-hui say "we do not eat Mongol food". [Cinggis Qa’an replied:] "By the aid of heaven we have pacified you; you are our slaves. Yet you do not eat our food or drink. How can this be right?" He thereupon made them eat. "If you slaughter sheep, you will be considered guilty of a crime." He issued a regulation to that effect ... [In 1279/1280 under Qubilai] all the Muslims say: “if someone else slaughters [the animal] we do not eat". Because the poor people are upset by this, from now on, Musuluman [Muslim] Huihui and Zhuhu [Jewish] Huihui, no matter who kills [the animal] will eat [it] and must cease slaughtering sheep themselves, and cease the rite of circumcision. Despite the military successes, strife continued within the Mongol ranks. Batu's relations with Güyük, Ögedei's eldest son, and Büri, the beloved grandson of Chagatai Khan, remained tense and worsened during Batu's victory banquet in southern Kievan Rus'. Nevertheless, Güyük and Buri could not do anything to harm Batu's position as long as his uncle Ögedei was still alive. Ögedei continued with offensives into the Indian subcontinent, temporarily investing Uchch, Lahore, and Multan of the Delhi Sultanate and stationing a Mongol overseer in Kashmir, though the invasions into India eventually failed and were forced to retreat. In northeastern Asia, Ögedei agreed to end the conflict with Goryeo by making it a client state and sent Mongolian princesses to wed Goryeo princes. He then reinforced his kheshig with the Koreans through both diplomacy and military force. The advance into Europe continued with Mongol invasions of Poland and Hungary. When the western flank of the Mongols plundered Polish cities, a European alliance among the Poles, the Moravians, and the Christian military orders of the Hospitallers, Teutonic Knights and the Templars assembled sufficient forces to halt, although briefly, the Mongol advance at Legnica. The Hungarian army, their Croatian allies and the Templar Knights were beaten by the Mongols at the banks of the Sajo River on 11 April 1241. Before Batu's forces could continue on to Vienna and northern Albania, news of Ögedei's death in December 1241 brought a halt to the invasion. As was customary in Mongol military tradition, all princes of Genghis's line had to attend the kurultai to elect a successor. Batu and his western Mongol army withdrew from Central Europe the next year. Güyük Khan demanding Pope Innocent IV's submission. The letter was written in Persian. Hulagu, Genghis Khan's grandson and founder of the Il-Khanate. From a medieval Persian manuscript. The Muslims from Qazvin denounced the menace of the Nizari Ismailis, a well-known sect of Shiites. The Mongol Naiman commander Kitbuqa began to assault several Ismaili fortresses in 1253, before Hulagu advanced in 1256. Ismaili Grand Master Rukn al-Din Khurshah surrendered in 1257 and was executed. All of the Ismaili strongholds in Persia were destroyed by Hulagu's army in 1257, except for Girdkuh which held out until 1271. His army advanced towards Ayyubid-ruled Syria, capturing small local states en route. The sultan Al-Nasir Yusuf of the Ayyubids refused to show himself before Hulagu; however, he had accepted Mongol supremacy two decades earlier. When Hulagu headed further west, the Armenians from Cilicia, the Seljuks from Rum and the Christian realms of Antioch and Tripoli submitted to Mongol authority, joining them in their assault against the Muslims. While some cities surrendered without resisting, others, such as Mayafarriqin fought back; their populations were massacred and the cities were sacked. The extent of the Mongol Empire after the death of Möngke Khan (reigned 1251–1259). The samurai Suenaga facing Mongol's bomb and Goryeo's arrows. Mōko Shūrai Ekotoba (蒙古襲来絵詞), circa 1293. As the power of the Mongols declined, chaos erupted throughout the empire as non-Mongol leaders expanded their own influence. The Golden Horde lost all of its western dominions (including modern Belarus and Ukraine) to Poland and Lithuania between 1342 and 1369. Muslim and non-Muslim princes in the Chagatai Khanate warred with each other from 1331 to 1343, and the Chagatai Khanate disintegrated when non-Genghisid warlords set up their own puppet khans in Transoxiana and Moghulistan. Janibeg Khan (r. 1342–1357) briefly reasserted Jochid dominance over the Chaghataids. Demanding submission from an offshoot of the Ilkhanate in Azerbaijan, he boasted that "today three uluses are under my control". The executed – the long and full beard probably means he is not a Mongol – has been thrown off a cliff. A 1305 letter (on a scroll measuring 302 by 50 centimetres (9.91 by 1.64 ft)) from the Ilkhan Mongol Öljaitü to King Philip IV of France. ^ a b c d Rein Taagepera (September 1997). "Expansion and Contraction Patterns of Large Polities: Context for Russia". International Studies Quarterly. 41 (3): 475–504. doi:10.1111/0020-8833.00053. JSTOR 2600793. ^ Gregory G.Guzman "Were the barbarians a negative or positive factor in ancient and medieval history? ", The Historian 50 (1988), 568–70. ^ a b c Barfield. p. 184. ^ Neil Pederson (2014). "Pluvials, droughts, the Mongol Empire, and modern Mongolia". Proceedings of the National Academy of Sciences. 111 (12): 4375–79. Bibcode:2014PNAS..111.4375P. doi:10.1073/pnas.1318677111. PMC 3970536. PMID 24616521. Archived from the original on 14 March 2014. Retrieved 11 March 2014. ^ a b c d e Morgan. The Mongols. pp. 49–73. ^ Riasanovsky. Fundamental Principles of Mongol law. p. 83. ^ a b Secret history. p. 203. ^ Man. Genghis Khan. p. 288. ^ Collectif 2002, p. 147. ^ May 2004, p. 50. ^ Schram 1987 Archived 17 October 2015 at the Wayback Machine, p. 130. ^ eds. Seaman, Marks 1991, p. 175. ^ Hucker 1985, p. 66. ^ May. Chormaqan. p. 29. ^ a b Timothy May. Chormaqan. p. 32. ^ "The Destruction of Kiev". Tspace.library.utoronto.ca. Archived from the original on 19 August 2016. Retrieved 12 October 2013. ^ Jackson. Delhi Sultanate. p. 105. ^ Henthorn, William E. (1963). Korea: the Mongol invasions. E.J. Brill. pp. 160, 183. ^ a b Weatherford. p. 158. ^ Matthew Paris. English History (trans. by J. A. Giles). p. 348. ^ a b Morgan. The Mongols. p. 104. ^ a b Jackson. Mongols and the West. p. 95. ^ The Academy of Russian science and the academy of Mongolian science Tataro-Mongols in Europe and Asia. p. 89. ^ Man. Kublai Khan. p. 28. ^ a b c d e Atwood. p. 255. ^ a b Atwood. p. 213. ^ a b c Morgan. The Mongols. p. 159. ^ a b c Morgan. The Mongols. pp. 103–04. ^ Guzman, Gregory G. (Spring 2010). "European Captives and Craftsmen Among the Mongols, 1231–1255". The Historian. 72 (1): 122–50. doi:10.1111/j.1540-6563.2009.00259.x. ^ a b Allsen. Mongol Imperialism. p. 280. ^ a b Morgan. The Mongols. p. 129. ^ a b Morgan. The Mongols. pp. 132–35. ^ Morgan. The Mongols. pp. 127–28. ^ a b Morgan. The Mongols. p. 138. ^ a b Wassaf. p. 12. ^ a b Jackson. Mongols and the West. p. 109. ^ a b Barthold. Turkestan. p. 488. ^ Barthold. Turkestan Down to the Mongol Invasion. p. 446. ^ Prawdin. Mongol Empire and Its Legacy. p. 302. ^ Man. Kublai Khan. p. 74. ^ Sh.Tseyen-Oidov – Ibid. p. 64. ^ Man. Kublai Khan. p. 207. ^ Vernadsky. The Mongols and Russia. pp. 344–66. ^ Henryk Samsonowicz, Maria Bogucka. A Republic of Nobles. p. 179. ^ d.Ohson. History of the Mongols. p. II. p. 355. ^ Sh.Tseyen-Oidov. Genghis bogdoos Ligden khutagt khurtel (khaad). p. 81. ^ Vernadsky – The Mongols and Russia. p. 74. ^ Allsen. Culture and Conquest. pp. 32–35. ^ Allsen. Culture and Conquest. p. 39. ^ G., Ghazarian, Jacob (2000). The Armenian kingdom in Cilicia during the Crusades : the integration of Cilician Armenians with the Latins, 1080–1393. Richmond: Curzon. pp. 159–61. ISBN 978-0-7007-1418-6. OCLC 45337730. ^ Morgan. The Mongols. pp. 117–18. ^ Ole Jørgen Benedictow, The Black Death, 1346–1353: The Complete History (2004), p. 382.p. 382. ^ a b Prawdin. p. 379. ^ a b Morgan. The Mongols. pp. 80–81. ^ Buell, Paul D. (1979). "Sino-Khitan Administration in Mongol Bukhara". Journal of Asian History. 13 (2): 137–38. JSTOR 41930343. ^ a b Foltz. pp. 105–06. ^ Ezzati. The Spread of Islam: The Contributing Factors. p. 274. ^ Bukharaev. Islam in Russia: The Four Seasons. p. 145. ^ Timothy May (February 2008). "The Mongol Empire in World History". World History Connected. 5 (2). Archived from the original on 10 February 2014. Retrieved 15 February 2014. ^ Hahn, Reinhard F. (1991). Spoken Uyghur. London and Seattle: University of Washington Press. ISBN 978-0-295-98651-7. ^ Svat Soucek. A History of Inner Asia. Cambridge University Press, 2000. ISBN 0-521-65704-0. p. 116. ^ Benedictow, Ole Jørgen (2004). The Black Death, 1346–1353: the Complete History. Boydell Press. p. 382. ISBN 978-1-84383-214-0. ^ a b "Mongol Conquests". Users.erols.com. Archived from the original on 28 October 2004. Retrieved 15 February 2014. ^ "History of Russia, Early Slavs history, Kievan Rus, Mongol invasion". Parallelsixty.com. Archived from the original on 21 January 2010. Retrieved 15 February 2014. ^ "The Mongol invasion: the last Arpad kings". Britannica.com. 20 November 2013. Archived from the original on 12 May 2008. Retrieved 15 February 2014. ^ Andrea Peto in Richard Bessel; Dirk Schumann (2003). Life After Death: Approaches to a Cultural and Social History of Europe During the 1940s and 1950s. Cambridge University Press. p. 143. ISBN 978-0-521-00922-5. Amitai-Preiss, Reuven (1995). Mongols and Mamluks: The Mamluk-Ilkhanid War, 1260–1281. Cambridge; New York: Cambridge University Press. ISBN 978-0-521-46226-6. Atwood, Christopher P. (2004). Encyclopedia of Mongolia and the Mongol Empire. New York: Facts on File, Inc. ISBN 978-0-8160-4671-3. Diamond, Jared (1997). Guns, Germs, and Steel: The Fates of Human Societies. New York: W. W. Norton & Co. ISBN 978-0-393-31755-8. Foltz, Richard C. (1999). Religions of the Silk Road: Overland Trade and Cultural Exchange from Antiquity to the Fifteenth Century. New York: St. Martin's Press. ISBN 978-0-312-23338-9. Grousset, Rene (1970). The Empire of the Steppes: A History of Central Asia (translated from French by Naomi Walford). New Brunswick, NJ: Rutgers University Press. Halperin, Charles J. (1985). Russia and the Golden Horde: The Mongol Impact on Medieval Russian History. Bloomington, IN: Indiana University Press. ISBN 978-0-253-20445-5. Jackson, Peter (2003). The Delhi Sultanate: A Political and Military History. Cambridge; New York: Cambridge University Press. ISBN 978-0-521-54329-3. Morgan, David (2007). The Mongols (2nd ed.). Malden, MA; Oxford, UK; Carlton, Victoria, Australia: Blackwell Publishing. ISBN 978-1-4051-3539-9. Ratchnevsky, Paul (1993). Haining, Thomas Nivison (translator) (ed.). Genghis Khan: His Life and Legacy. Wiley-Blackwell. ISBN 978-0-631-18949-7. Rossabi, Morris (1983). China Among Equals: The Middle Kingdom and Its Neighbors, 10th–14th Centuries. Berkeley: University of California Press. ISBN 978-0-520-04383-1. Sanders, Alan J.K. (2010). Historical Dictionary of Mongolia. Lanham, Maryland: Scarecrow Press. ISBN 978-0-8108-6191-6. Saunders, John Joseph (2001). The history of the Mongol conquests. Philadelphia: University of Pennsylvania Press. ISBN 978-0-8122-1766-7. Weatherford, Jack (2004). Genghis Khan and the Making of the Modern World. New York: Three Rivers Press. ISBN 978-0-609-80964-8. Ostrowski, Donald (1998). "The "tamma" and the Dual-administrative Structure of the Mongol Empire". Bulletin of the School of Oriental and African Studies, University of London 61 (2). Cambridge University Press: 262–77. https://www.jstor.org/stable/3107652. "Remnants of the Mongol imperial tradition" (PDF). Iver B.Neumannand Einar Wigen. The London School of Economics and Political Science. A Borjigin (Mongolian: Боржигин, translit. Borjigin; ᠪᠣᠷᠵᠢᠭᠢᠨ; Russian: Борджигин, translit. Bordžigin; English plural: Borjigins or Borjigid; [Middle Mongolian plural? ]: [term? ], translit. Borǰigit; [Manchu plural? ]: ) is a member of the sub-clan, which started with Yesugei (but the Secret History of the Mongols makes it go back to Yesugei's ancestor Bodonchar), of the Kiyat clan. Yesugei's descendants were thus said to be Kiyat-Borjigin. The senior Borjigid provided ruling princes for Mongolia and Inner Mongolia until the 20th century. The clan formed the ruling class among the Mongols and some other peoples of Central Asia and Eastern Europe. Today, the Borjigid are found in most of Mongolia, Inner Mongolia and Xinjiang, although genetic research has shown that descent from Genghis Khan is common in Central Asia. The Chagatai Khanate (Mongolian: Цагаадайн Хаант Улс Tsagadaina Khaanat Ulus) was a Mongol and later Turkicized khanate that comprised the lands ruled by Chagatai Khan, second son of Genghis Khan, and his descendants and successors. Initially it was a part of the Mongol Empire, but it became a functionally separate khanate with the fragmentation of the Mongol Empire after 1259. The Chagatai Khanate recognized the nominal supremacy of the Yuan dynasty in 1304, but became split into two parts in the mid-14th century: the Western Chagatai Khanate and the Moghulistan Khanate. At its height in the late 13th century, the Khanate extended from the Amu Darya south of the Aral Sea to the Altai Mountains in the border of modern-day Mongolia and China.The khanate lasted in one form or another from 1220s until the late 17th century, although the western half of the khanate was lost to Timur's empire by 1370. The eastern half remained under Chagatai khans, who were, at times, allied or at war with Timur's successors, the Timurid dynasty. Finally, in the 17th century, the remaining Chagatai domains fell under the theocratic regime of Afaq Khoja and his descendants, the Khojas, who ruled Xinjiang under Dzungar and Manchu overlordships consecutively. Chilaun (Mongolian: Чулуун) was a general in the Mongol Empire, known as one of Genghis Khan's four valiant warriors. His relatives, specifically his father Sorqan-Shira, helped young Genghis escape from captivity at the hands of the Tayichiuds. His descendants include Chupan. His name "Chuluun" means "rock/rocky" in the Mongolian language. Genghis Khan (born Temüjin, c. 1162 – August 18, 1227, Modern Mongolian pronunciation [ˈt͡ɕʰiŋɡɪs χaːɴ], Middle Mongol pronunciation [ˈt͡ɕʰiŋːɡɪs ˈkaχaːn] or [ˈt͡ʃʰiŋːɡɪs ˈqaχaːn]) was the founder and first Great Khan of the Mongol Empire, which became the largest contiguous empire in history after his death. He came to power by uniting many of the nomadic tribes of Northeast Asia. After founding the Empire and being proclaimed "Genghis Khan", he launched the Mongol invasions that conquered most of Eurasia. Campaigns initiated in his lifetime include those against the Qara Khitai, Caucasus, and Khwarazmian, Western Xia and Jin dynasties. These campaigns were often accompanied by large-scale massacres of the civilian populations – especially in the Khwarazmian and Western Xia controlled lands. By the end of his life, the Mongol Empire occupied a substantial portion of Central Asia and China. Before Genghis Khan died he assigned Ögedei Khan as his successor. Later his grandsons split his empire into khanates. Genghis Khan died in 1227 after defeating the Western Xia. By his request, his body was buried in an unmarked grave somewhere in Mongolia. His descendants extended the Mongol Empire across most of Eurasia by conquering or creating vassal states in all of modern-day China, Korea, the Caucasus, Central Asia, and substantial portions of Eastern Europe and Southwest Asia. Many of these invasions repeated the earlier large-scale slaughters of local populations. As a result, Genghis Khan and his empire have a fearsome reputation in local histories.Beyond his military accomplishments, Genghis Khan also advanced the Mongol Empire in other ways. He decreed the adoption of the Uyghur script as the Mongol Empire's writing system. He also practiced meritocracy and encouraged religious tolerance in the Mongol Empire, and unified the nomadic tribes of Northeast Asia. Present-day Mongolians regard him as the founding father of Mongolia.Genghis Khan was known for the brutality of his campaigns, and is considered by many to have been a genocidal ruler. However, he is also credited with bringing the Silk Road under one cohesive political environment. This brought relatively easy communication and trade between Northeast Asia, Muslim Southwest Asia, and Christian Europe, expanding the cultural horizons of all three areas. 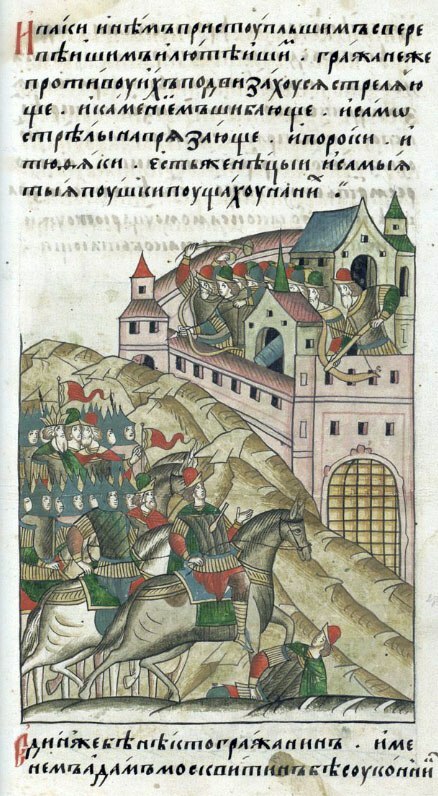 As part of the Mongol invasion of Europe, the Mongol Empire invaded Kievan Rus' in the 13th century, destroying numerous cities, including Ryazan, Kolomna, Moscow, Vladimir and Kiev.The campaign was heralded by the Battle of the Kalka River in May 1223, which resulted in a Mongol victory over the forces of several Rus' principalities. The Mongols nevertheless retreated. A full-scale invasion of Rus' by Batu Khan followed, from 1237 to 1242. The invasion was ended by the Mongol succession process upon the death of Ögedei Khan. All Rus' principalities were forced to submit to Mongol rule and became part of the Golden Horde empire, some of which lasted until 1480.
fueled by the grass-foraging Mongol cavalry and cattle. Thus most Mongol conquest and plundering took place during the warmer seasons, when there was sufficient grazing for the herds.Though the Mongol Empire began to fragment from 1260, Tartar and Mongol threats to the Russian states continued for centuries. Mongols continued to rule China into the 14th century under the Yuan dynasty, while Mongol rule in Persia persisted into the 15th century under the Timurid Empire. In India, the later Mughal Empire survived into the 19th century. Initially, it was a term for a military commander in the army of Genghis Khan: the term "noyon" applied to commanders of tumens and mingghans, military units of 10,000 and 1,000 soldiers respectively. During conquests, noyons used to receive territories for administration and they effectively became aristocracy, into the 20th century. Noyans were above the ordinary Mongols in social rank but below the descendants of Genghis and his brothers. They were sometimes called emir or bey in the Ulus of Jochi, the Ilkhanate and the Chagatai Khanate while the Yuan records gave the equivalent as guanren, since their main task was waging warfare. Usually notable persons are referred to followed "Noyan", similarly to the usage of the title "Khan", e.g., Jebe Noyan, Chormaqan Noyan, Sali Noyan and Karik Noyan.